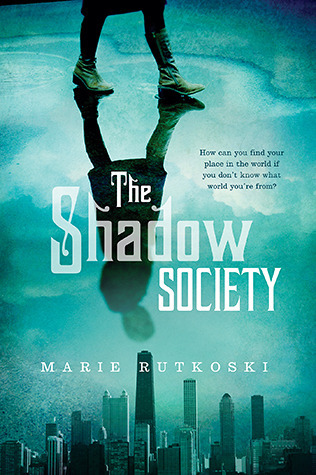 The Shadow Society by Marie Rutowski. Farrar Straus Giroux, 2013. Currently Available. Face Value: This is a great fantasy cover. It’s atmospheric and interesting – the shadowed image on the front reflects both the idea of Shades and the idea of alternate realities. The Chicago skyline is identifiable and obviously, really pretty to look at. No shame in reading this one in public whatsoever. Does it Break the Slate? Obviously. Darcy Jones is the best. She’s a great example of a tough female protagonist of an action/adventure novel who is neither a delicate trembling flower nor an emotionless robot of toughness. I love her, and love her story. Plus, the supporting cast is not all boys. There are some great female characters in featured roles, from best friend Lily to surprise potential ally Savannah. Who would we give it to? Rutowski is an expert world builder, and I think that this alternate world fantasy will definitely appeal to Hunger Games and Divergent readers looking for something along those lines with a totally different story. Plus any Chicagoans will appreciate the attention to detail in creating the alternate reality version of the city. It’s been five years since I lived in Chicago but I still love reading about it in almost any form. Review: Things are finally coming together for Darcy Jones. Ever since she was abandoned in front of a Chicago firehouse at age five, she’s never had a place that felt like home. But her current foster home seems like it might actually last and she’s going to start the school year in the same school she went to the year before. She has real friends, an art class she loves, and the possibility of making it through the year. But when Conn McCrea shows up at her school everything she’s ever known is called into question. What starts as a budding romance turns terrifying. When Conn betrays her, Darcy finds out she is actually a Shade, a being from an alternate-Chicago that split off from our world when the Great Chicago Fire happened / didn’t happen in the two universes. Thrown into a totally new universe, Darcy has to figure out who she is, who to trust, and how to save herself. This is an impressively complex narrative. Trying to write that description just now in a way that a) made sense, b) didn’t spoil anything and c) conveyed how in-depth the storyline is was really challenging. Rutowski has clearly put a ton of work into establishing a thorough world, and the effort pays off. Despite its complexity, the narrative flies by, and almost always makes sense. It’s a really well-crafted story. The plot is terrific, and so are the characters. As I mentioned above, Darcy is a richly developed protagonist who is tough and vulnerable, and thoroughly worth rooting for. And I loved her friends, who really come through for her in the end. Even the villains are much more complicated than you would expect them to be – both more evil and more human. I’m pretty sure that this was written as a standalone novel, which I really love in a contemporary fantasy. While I wouldn’t complain if there was a sequel giving us more to Darcy’s story, I really loved the way the book wrapped up. This entry was posted in Reviews, Young Adult and tagged Action/Adventure, Alternate Realities, Chicago, Foster System, Speculative Fiction. Bookmark the permalink. Reblogged this on Polly's Blog.